Much admired by Aaron Copland, the Argentine composer Alberto Ginastera (1916-1983) is widely regarded as one of the most important and original South American composers of the 20th century. 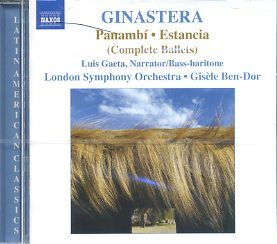 The two ballets featured on this recording belong to Ginastera’s early period when he was eager to promote an authentically national voice in his work through the use of Argentine folk and popular elements. The exotically scored Panambí is based on a romantic and supernatural legend of love and magic from the Guaraní Indians, a tribe from the headwaters of the Rio Paraná in northern Argentina. Estancia (a farm or cattle ranch) is a powerful and passionate evocation of the vast and enigmatic Argentine pampas and the spirit of “the unlucky gaucho, who has no one to call to, with no place of his own in all that space, and in all that darkness”.